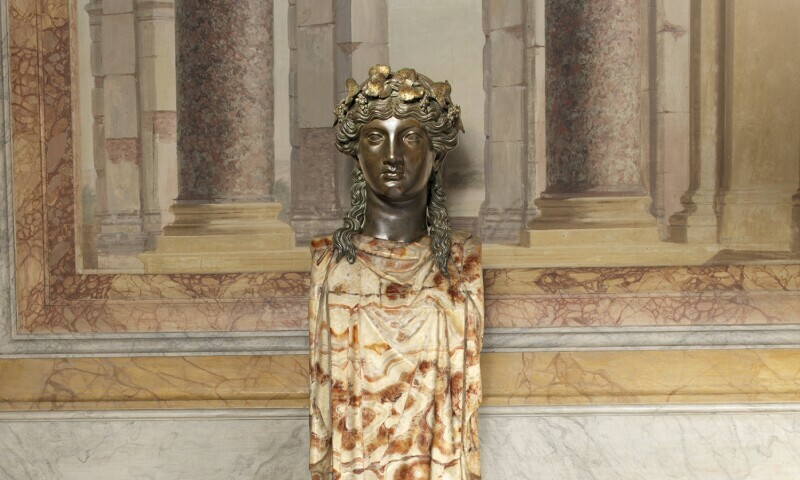 Luigi Valadier, Herma with Bacchus for the Palazzo Borghese (detail), alabaster and glazed bronze, traces of gilding, 1773. This fall, the Frick presents the first monographic exhibition devoted to one of the most important figures of 18th Century Italian decorative arts, Luigi Valadier (1726–1785). He was a talented draftsman, designer, goldsmith, silversmith, and bronze founder, using precious stones as well as enamel, wood and glass, to create whimsical and elegant works of art for noble clients. The exhibition is curated by Alvar González-Palacios, who has dedicated most of his life to scholarship on the artist and is considered its foremost expert. Luigi Valadier: Splendor in Eighteenth-Century Rome will highlight Valadier’s oeuvre, presenting more than fifty objects as well as drawings that represent the breadth of his career. Never before has an American museum audience been able to view together so many examples of his production, with significant loans coming from public institutions as well as private collections in Europe and the United States. Likewise, the accompanying book is the first substantial monograph published on Valadier, and with the show, it will provide a vivid and unprecedented account of this man’s work. As with the Frick’s highly acclaimed 2016 exhibition on Piere Gouthière, this project will allow the broader public to enjoy a much-needed study of a significant figure in the decorative arts whose imagination and skills made him one of the soaring figures in his time. In this case, the subject is Roman rather than Parisian, and the exhibition and book add dimension to a strong year of Italian programming at the Frick, which began this summer with an exhibition related to a commission by sculptor Antonio Canova and continues this winter and spring with shows on painters Giovanni Battista Moroni and Giovanni Battista Tiepolo.